Herbs, annual, cespitose. Culms 1-6(-25), trigonous to roundly trigonous, (0.5-)2-5(-9) cm × 0.2-0.4-(0.6) mm, glabrous. Leaves 1-6, V-shaped, 1-6 cm × 0.3-1 mm. 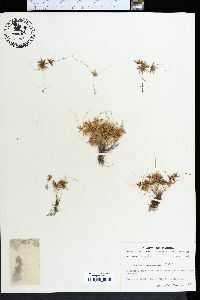 Inflorescences: heads digitate, loosely ovoid, 3-18 × 3-26 mm; rays (0-)1-6(-8), 2.5-20(-30) mm; bracts 2-3(-5), horizontal to ascending at 45(-60)°, V-shaped, 2-60 × 0.3-1.2 mm. Spikelets (3-)10-20(-30), greenish to reddish brown, narrowly ellipsoid to oblong, 3-11 × (0.8-)1.2-1.5 mm; floral scales (3-)6-20(-28), laterally greenish to reddish brown, glossy, medially greenish to light reddish brown, strongly recurved, laterally ribless, medially strongly 3-ribbed, oblong-ovate, (0.8-)1-1.3 × 0.8-1(-1.2) mm, apex emarginate, cusp 0.6-1.2 mm. Flowers: stamens 2 or 3; anthers oblong-ovoid, 0.1(-0.2) mm; styles (0.2-)0.4-0.6 mm; stigmas 0.3-0.5 mm. Achenes brown, oblong-obovoid, (0.5-)0.6 × (0.3-)0.4 mm, base cuneate, apex blunt, surfaces coarsely papillose. Fruiting summer. Damp, disturbed soils; 0-300 m; Ala., Fla., Ga., S.C.; Mexico; Central America; South America.